The Business Environment and Concepts (BEC) CPA Exam section tests your knowledge of the business environment and related concepts. BEC is unique for including written communications (WCs) in addition to the multiple-choice questions (MCQs) and task-based simulations (TBSs) that make up the other CPA Exam sections. How do I pass BEC? To pass BEC, you’ll need to understand a wide range of accounting concepts at a basic level and be able to communicate clearly and effectively about business operations. The rest of this guide will show you how you need to prepare for the BEC section of the CPA Exam. But if you’re already studying, check out some of our free webinars and videos or make use of our free BEC questions. You will also find study tips specifically for BEC later in the guide. • How do I pass BEC? How is CPA BEC graded? • What is a CPA passing score? • Is the CPA Exam curved? • Can I receive partial credit on Written Communications (WCs) and Task-Based Simulations (TBSs)? • When are new pronouncements testable? • When are new BEC law topics testable? How hard is it to pass BEC? • When should I take BEC? How do I prepare for BEC? • What is the best way to study for the BEC Written Communications (WCs)? From 2008 to 2010, BEC had among the lowest CPA Exam pass rates of all the sections. In 2011, BEC took a turn for the better and has since had the highest pass rate every quarter for the past eight years. 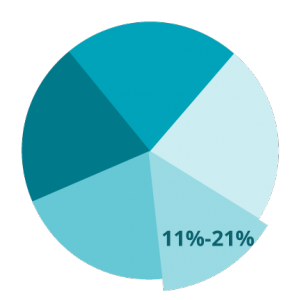 Of all CPA Exam sections, BEC has had the highest pass rate every quarter for the past eight years. 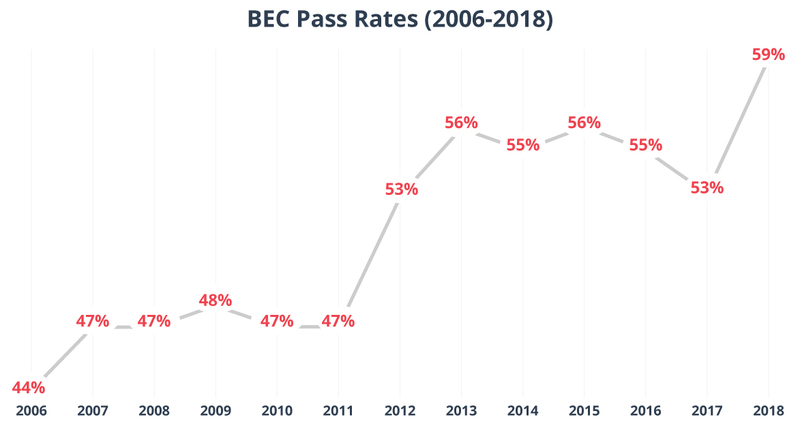 Since 2006, BEC’s lowest average pass rate has been 41.8% (Q1 2006), and its highest pass rate has been 60.3% (Q2 2018). We fully expect the current trend to continue moving forward in the absence of major exam shakeups: Of the four sections, BEC should have the highest pass rates in 2019. It’s a good decade to sit for BEC. For more information on changes to the BEC CPA Exam section this year, visit our CPA Exam Changes page. Take a more detailed look at CPA Exam pass rates, including seasonal trends. The BEC CPA Exam section consists of five testlets: two MCQ, two TBS, and one WC. 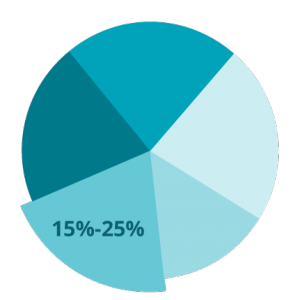 The MCQ testlets account for 50% of your BEC score, the TBS testlets contribute 35%, and the WC testlet supplies the remaining 15%. The AICPA prescribes two levels of difficulty to MCQ testlets: “medium” and “difficult.” These indicate the average difficulty of questions within the testlet. Like the other CPA Exam sections, the second BEC MCQ testlet adapts to your performance on the first. According to the AICPA, there is no advantage or disadvantage to receiving harder or easier questions because the exam takes question difficulty into account during grading. In short, harder questions are worth more points. The difficulty of the first MCQ testlet you receive is medium. The difficulty of the next testlet is determined by your performance on the first. If you perform well on the first testlet, you will receive a difficult testlet. If you do not perform well on the first testlet, you will receive another medium testlet. Because the difficulty assigned to each testlet is based on the average difficulty of the MCQs, expect a few questions to give you pause, even in a medium testlet. Be ready to flag any confusing questions that stump you and come back to them once you’ve finished the rest of the testlet. Your performance on the MCQ testlets does not impact the difficulty level of your TBS or WC testlets. TBS and WC testlets are pre-selected, and their difficulty does not change based on your performance. Most BEC testlets include operational and pre-test questions. Operational questions count toward your total exam score and pre-test questions do not. That said, the questions are indistinguishable from one another, so don’t waste any valuable testing time trying to decide whether you can afford to skip a question! Why does the AICPA include pre-test questions on the exam? The AICPA looks to continuously evolve and improve the CPA Exam. Pre-test questions are potential future exam questions the AICPA is trying out by inserting them among real exam questions. This lets it study how suitable the questions will be for future use. The AICPA already knows what topics the operational questions test and how difficult they are, so it is able to analyze candidate performance on pretest questions with the operational questions serving as a sort of control. While no one likes to be a guinea pig for experiments—especially on an exam this difficult—keep in mind that your score on these questions will not count. The pre-test questions that meet the AICPA’s standards are included as operational questions on later iterations of the exam. This pre-test period is also used to assign a difficulty level to questions for grading purposes, and questions continue to undergo statistical analysis based on the live exam. Pre-test questions may be more difficult than operational questions, but because the two types are indistinguishable, it’s best to answer all questions to the best of your ability. If it helps, whenever you encounter a really difficult question and aren’t sure of your answer, just tell yourself it’s probably a pre-test question, make an educated guess, and keep moving! What is a CPA passing score? The CPA Exam is scored on a scale from 0 – 99. As with the other three exam sections, you must score a 75 or higher to pass BEC. 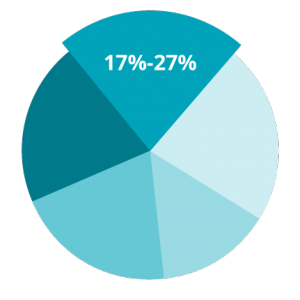 That’s 75 points, which does not necessarily mean you need to answer 75% of questions correctly. Difficult MCQs are worth more points, so a strong performance on the first MCQ testlet can give you an opportunity to earn even more points in the second MCQ testlet. Difficult questions are also more time-consuming, so you’ll need to practice a time-management strategy to optimize your score. Your WC responses are graded according to both technical content and writing quality. “Technical content” means information that is helpful and relevant. But because a non-CPA may grade your WCs, “helpful and relevant” may be broadly defined. The more on-topic information you can include, the better, assuming you have the time. Grammar, punctuation, spelling, and word usage. Level of detail, examples given, and terms defined. The use of a thesis sentence, transitions, and unified paragraphs as well as the logical progression of your response. Your final score is scaled according to the difficulty of the MCQs you answered correctly, the credit you receive on the WCs and TBSs, and the weights assigned to the different types of testlet. We cover our top Written Communication writing tips later in this guide. Is the CPA Exam curved? The CPA Exam is not curved in the same way as other exams you might have come across in your accounting studies. Instead of adjusting your score based on how your cohort does, the AICPA uses question weights. These weights are assigned based on how candidates fared with the questions on previous exams. So your score is impacted by the performance of past test takers—but not current. It’s worth repeating here that your score is not a percent. 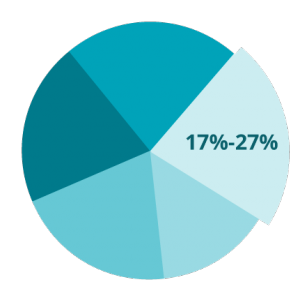 You don’t have to get 75% of the questions right—you just need a score of 75. If you think you’re borderline passing, you’re probably fine. A 65% may in fact be 75 points after it’s scaled. Can I receive partial credit on Written Communications (WCs) and Task-Based Simulations (TBSs)? Yes, you can receive partial credit on WCs and TBSs! Never leave any part of a question blank, and always double-check to make sure you’ve answered all parts of a question. If you have any extra time at the end of your WC testlet, reread your responses and see whether you can flesh them out with a little more detail. What if I have a question about scoring that wasn’t answered here? For more information on how your BEC section will be scored, please check out our guide to CPA Exam scoring. You can also see the AICPA’s FAQs or contact one of our Personal Counselors. We’re always here to help! The AICPA publishes CPA Exam Blueprints that specify exactly what a CPA needs to know, all the way down to specific tasks. BEC assesses your comprehension of a CPA’s responsibilities and professional duties by testing major five content areas. It’s good to look over the higher-level concepts to get a broad idea of what you should be taking away from your studies, but the Blueprints aren’t really useful for candidates making a study plan. The Blueprints are incredibly detailed, and if you were to go through them on your own, you’d likely spend just as much time figuring out what to study and how much time to devote to each topic as you would actually preparing for the exam. Our recommendation is to let a CPA Exam review course provider do the bulk of the work for you. All major providers have teams of experts that pore over each Blueprint update, taking the guesswork out of studying. Learn how to find the right review course for you. When are new pronouncements testable? New accounting and auditing pronouncements are eligible to be tested the later of (1) the first testing window beginning after the pronouncement’s earliest mandatory effective date or (2) the first testing window beginning six months after the pronouncement’s issuance date. Once a new pronouncement is testable, questions testing the old pronouncement will be removed. The Gleim CPA Review Course is automatically updated to reflect the latest testable information. When are new BEC law topics testable? 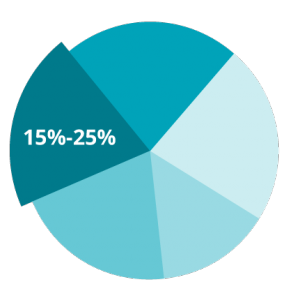 With such high pass rates (59% cumulative for 2018), BEC is considered the easiest section of the CPA Exam. FAR has traditionally been considered the hardest, and AUD and REG are generally somewhere between the two extremes. That being said, no section of the CPA Exam is easy. The BEC section tests you at advanced levels of skill. This level is primarily tested with MCQs. This tests the ability to understand memorized principles. This level is primarily tested with MCQs and possibly with TBSs. This tests the ability to apply memorized principles to a given situation. This level is primarily tested with TBSs and possibly with MCQs. This tests the ability to use multiple concepts together and apply them to a given situation. This level is tested with TBSs and only appears in Auditing. This tests the ability to evaluate information using multiple concepts to reach a conclusion. Each skill level builds upon the preceding one. BEC focuses heavily on Application and Analysis. BEC doesn’t test at the Evaluation level of higher-order skills, but it is the only CPA Exam section to include Written Communications (WCs). WCs are tested at the Application level. It’s especially important before you sit for BEC to make sure you can clearly communicate in writing the practical solution to a business situation. You must be able to explain and support why your answer is correct. When should I take BEC? BEC consistently has the highest pass rates among CPA Exam sections, so you have a lot of freedom with this section when deciding your CPA Exam schedule. However, it still requires a good deal of study time, as it covers a large amount of material, and the WCs may include content from other CPA Exam sections. First so that you can build your confidence and expose yourself to the subject matter of the other CPA Exam sections. Last so that you can bring your mastery of the other CPA Exam sections’ content to the table and end your testing experience on a more relaxed note. But this isn’t set in stone. The most important thing is to account for other demands on your time. If you are trying to pass a CPA Exam section but circumstances are taxing your time and energy (for example, if it’s accounting busy season), it’s probably a better idea to prepare for BEC than for FAR (the hardest CPA Exam section). The total testing time for BEC is four hours, which is the same for the other CPA Exam sections. The five testlets of the BEC CPA Exam section are independent. There are no time limits on the individual testlets, so it is up to you to manage your time so you can complete all five testlets before you run out of time. To effectively allocate your time on BEC, we recommend a time management system like this. It will take a good deal of practice to be able to answer questions quickly, but as you learn the material and complete more sample questions, you’ll build mastery of the topics and your speed will improve. If you can answer a question faster without risking misreading it, do it! That way, you’ll have a little extra time to spend on more difficult questions. If you encounter a difficult question and you haven’t settled on an answer in two minutes, make an educated guess, flag the question, and move on. If you have time later, you can return to it during your review. The best strategy is to work at a pace that allows you to read and respond to every single question. As you can see, this time management system gives you 17 minutes to use how you want. You can spend it polishing your WC responses or reviewing your MCQ and TBS answers. Just remember, you can’t revisit any previously submitted testlets, so only bank the time if you need it. To pass BEC, it’s important to have a firm grasp on the fundamentals. You will want to rely on a tried-and-true CPA Exam review course that can help you move through the breadth of topics in BEC at a manageable pace. The BEC questions you’ll see in the Gleim CPA Review are just as challenging and realistic as those on the actual exam. By the time you complete our Final Review, you’ll be completely prepared and confident for exam day! The Gleim Premium CPA Review course can help you pass BEC on your first try. Our course covers the CPA Exam content better than any other and always contains the most up-to-date information. Our SmartAdapt™ technology constantly adjusts to help shore up any of your weak areas, which helps you get maximum results from your study time. It also features cumulative review questions to help build your recall of BEC topics you’ll need to know well. The fifth and final testlet of BEC includes three WCs, two of which will be graded and one that will be a pre-test question. You should not try to guess which is the ungraded pre-test scenario. Instead, respond to each scenario as though it will affect your grade. WC subject-matter may include topics from the AUD, FAR, and REG sections, but don’t let that intimidate you. The primary goal of the WCs is to evaluate your writing ability, not your knowledge of the topic presented. Graders may overlook minor technical mistakes and focus on off-topic information or unlawful or unethical advice. You should focus your effort on the presentation of your response. In a WC, your response must be in the form of a letter or business memo. You will be given a scenario, similar to how you’re questioned in a Task-Based Simulation, but rather than choose your answer from a list of possible options, you will have to write it yourself. The letter or memo you write must address the needs and concerns raised in the scenario as though you were a licensed CPA in the field. WCs commonly ask you to respond to an executive or an auditor with a recommendation or an explanation of given data. What is the best way to study for the BEC Written Communications (WCs)? The best way to study for WCs is to look at sample responses, review the grading criteria, and practice writing your own. The more practice WCs you write, the easier the exam will be. 1. Learn the content of the BEC section. The majority of your grade on BEC is MCQs and TBSs. It’s true that WCs may pull some topics from other CPA Exam sections, but the primary purpose of the WCs is to evaluate your writing ability. Even if you’ve decided to make BEC your first CPA Exam section, don’t worry too much. With a firm grasp of BEC concepts underpinning your WC responses, you’re free to turn your focus to learning how to write within the time constraints and how to properly format your response. 2. Learn the writing criteria. Expression – how well you meet the conventional standards of business English; that means proper grammar, punctuation, word usage, capitalization, and spelling. Development – how well you’re able to provide evidence: whether you supply ample information to support your positions and assertions. Organization – how well your response is structured: the order in which your ideas are presented and the strength of the connections between your ideas. 3. Know your time limit. You will have four hours of total testing time for BEC, so to make the most of it, you should use a CPA Exam time management system and allot 75 minutes to the WC testlet. That 75 minutes gives you 25 minutes to spend on your responses to each of the three scenarios in the testlet. When you practice WCs, stick to this time limit. It will help you to be prepared for the time limit during the actual exam. 4. Practice writing your responses. To maximize the amount of testing time you’ll have to complete the WC testlet, practice writing WC responses throughout your BEC study time. The more familiar you are with the process of writing a WC, the more time and effort you will be able to commit to refining your responses. You can practice writing your responses in the Gleim CPA BEC Review Course, which contains at least two unique WCs per study unit. 5. Don’t stress too much. I feel like many candidates seem to imply that the WCs were not something to stress about after the fact. Because of this, as candidates prepare, I always try to point out that most everyone with 150 hours of college coursework should have decent writing abilities. With that in mind, try not to over-analyze the BEC WC and just be familiar with the content. Practicing within the review course will have you ready to do well on this portion. Looking for more helpful CPA Exam prep tips? If you’re looking for a start-to-finish CPA Exam walk-through, check out our free CPA Exam Guide for more information! This free PDF contains our top tips for scheduling, studying, and sitting for the CPA Exam. Visit our CPA Exam Resource Center to view our latest CPA Salary Report, confirm that you meet CPA Exam requirements, and more.